At Crystal Carpets we like to go the extra mile if we can and are delighted to offer you a binding service to make your very own rugs. Just bring in your own carpet or buy a rem from us and we can have the edges bound to make sure they don’t fray. 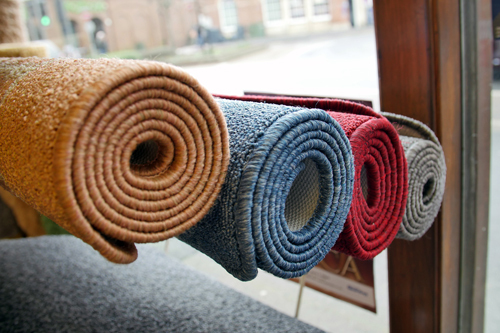 We stock a small range of Rugs and Door Mats in a variety of different colours and styles and sizes. These are just a few of the rugs we stock, if we do not have the correct size or colour in stock, we will be happy to order one in for you. We can also order in other similar rugs and mats in a range of sizes and colours so please do contact us and we will try to find the right rug for you. A good quality, attractive, multi-purpose rug. Machine washable. Hardwearing, Tough polypropylene pile with an anti-slip backing. Machine Washable at 30c. Colours: Beige, Green, Red, Charcoal, Terracotta and Brown. Very good quality machine-washable mat with dense cotton pile and a vinyl/rubber anti-slip backing. Highly absorbent and resilient. Colours: Black, Beige, Anthracite, Dark Brown, Granite and Bronze. Polypropylene Shaggy loop pile washable rug with an anti-slip latex backing. Colours: Black, Bright Pink, Camel, Chocolate, Cream, Electric Blue, Graphite, Kiwi Green, Lilac, Maroon, Plum, Sugar White, Terracotta. Colours: Available in all colours except: Electric Blue, Kiwi Green Plum and Lilac. Colours: Available in all colours except: Bright Pink, Electric Blue, Kiwi Green, Plum and Lilac.